We made a vow when we left on our 2013 Cross Country Road Trip to take more hikes in the national parks. 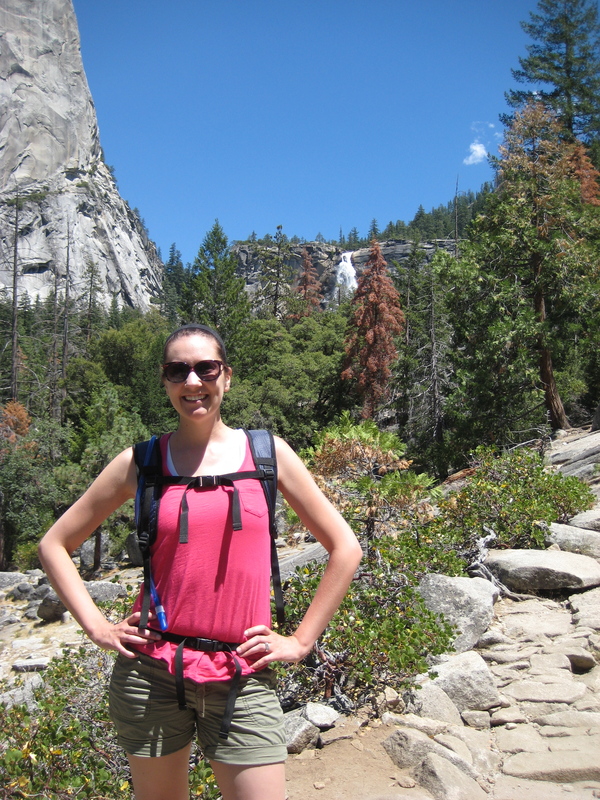 More specifically, we vowed to take a long (for us at least) hike in Yosemite. After much thought, we decided to hike the Mist Trail to see both Vernal and Nevada Falls returning via the John Muir Trail to make a 7 mile loop. 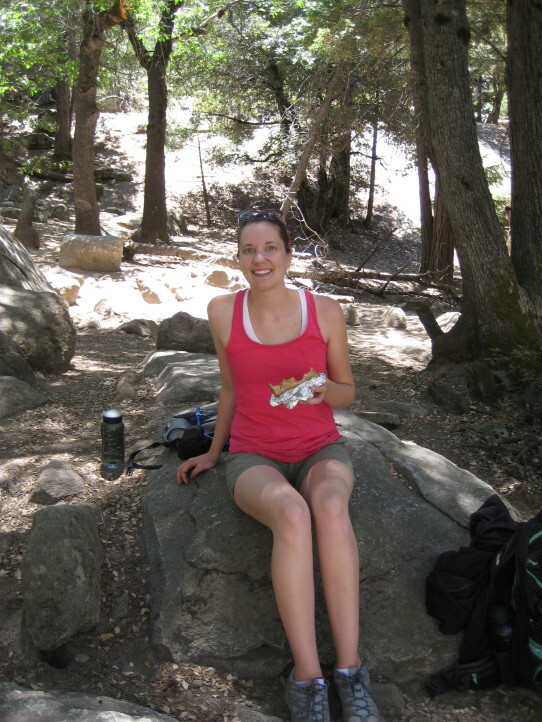 Distance: 3 miles round trip to Vernal Fall. 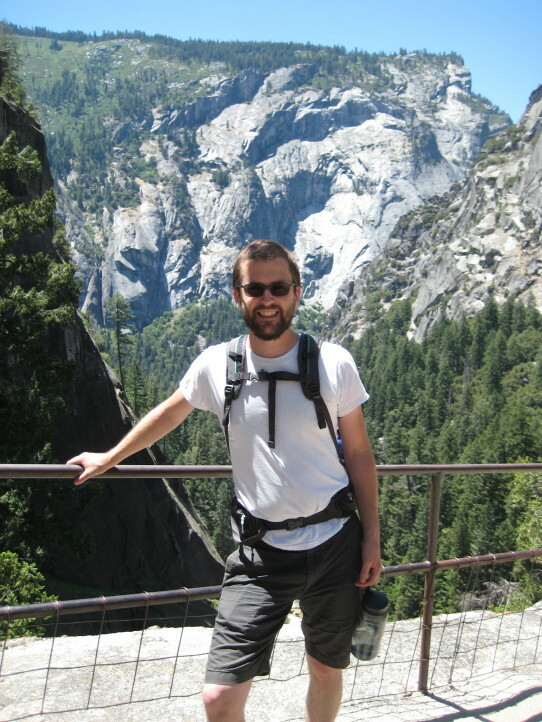 7 miles round trip (approximately) to Nevada Fall, returning via John Muir Trail. 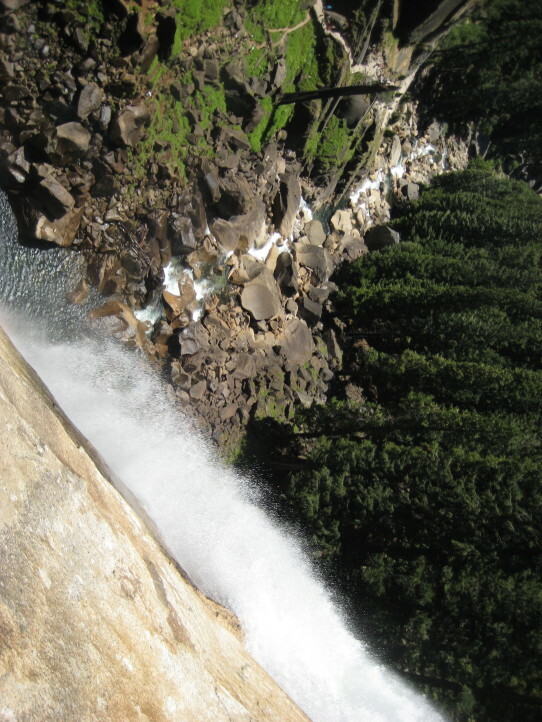 Elevation Gain: 1,000 feet to top of Vernal Fall. 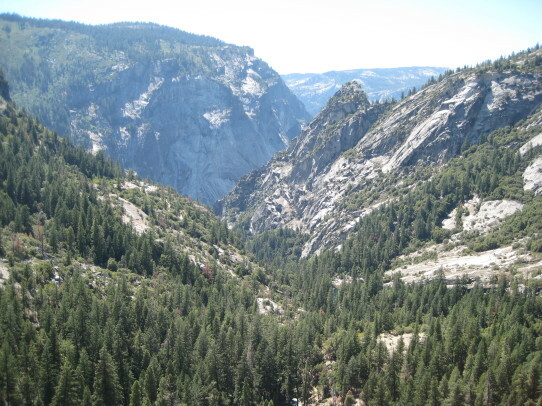 1,900 feet to top of Nevada Fall. You will feel every one of those 1,900 feet to the top. It’s steep! Time to Complete: 5-7 hours depending on how far up you hike and your pace. Number of Steps: Approximately 700+. 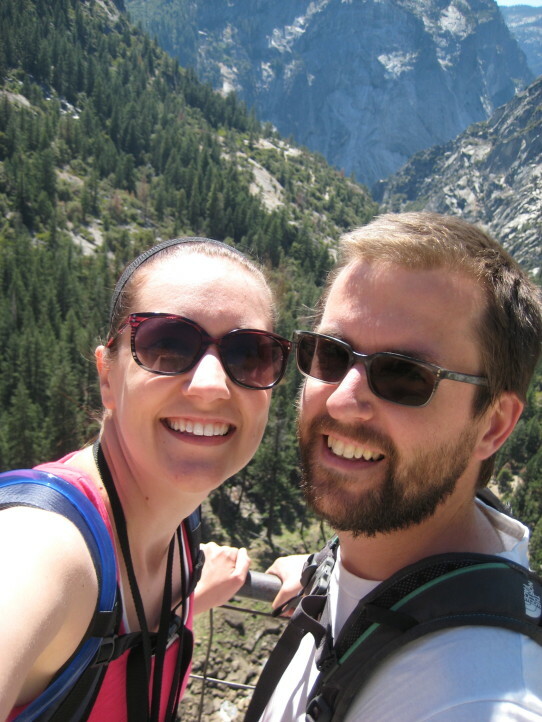 Now it’s time to talk about our experience hiking the Mist Trail. We took the shuttle from Yosemite Village to the Mist Trail trailhead. 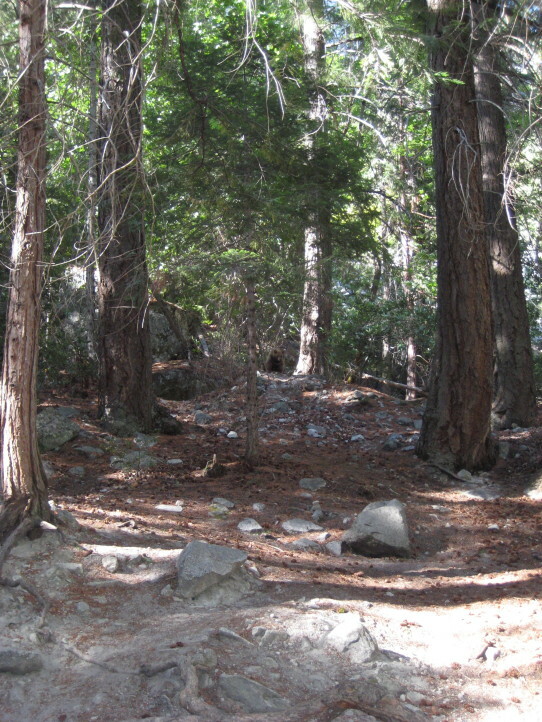 You could certainly walk from the parking area to the trailhead, but it will add on a couple extra miles to the hike. 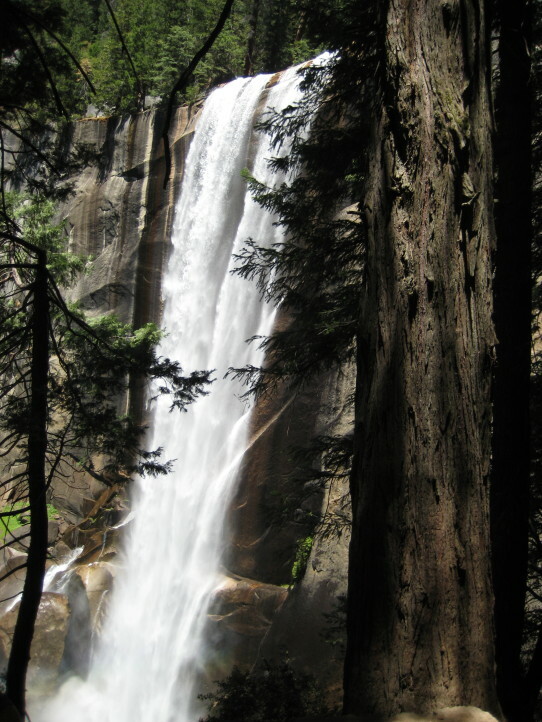 Once you reach the footbridge at Vernal Fall you have the option to continue on the Mist Trail or take the John Muir Trail up to see Nevada Fall. Special Note: This is the last stop with running water. Top off your water bottles here. One of us suffers from a fear of heights. We won’t say who, but this portion of the hike gave her a mild case of the heebie-jeebies due to the steep, jagged steps. 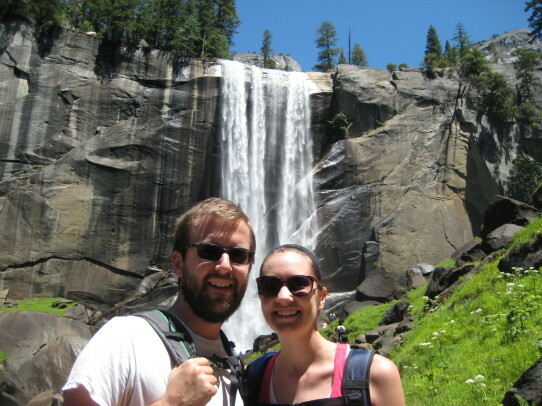 Despite the heebie-jeebies, we were able to pose for a picture in front of Vernal Fall. Steps, steps, and more steps. This accurately describes the first portion of the Mist Trail. It’s rugged and tiring, but the view around you will make it all worthwhile. We take frequent breaks on hikes like this. Mostly to take in the views, but sometimes we need a breather too. See what we mean about the steps? 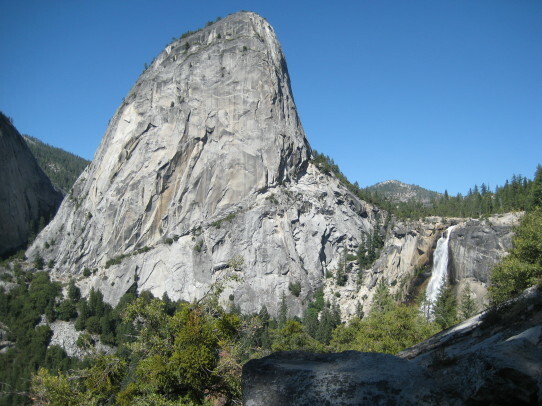 Once you reach the top of Vernal Fall, there are lots of places to rest. We decided this was a perfect point to stop and have lunch. 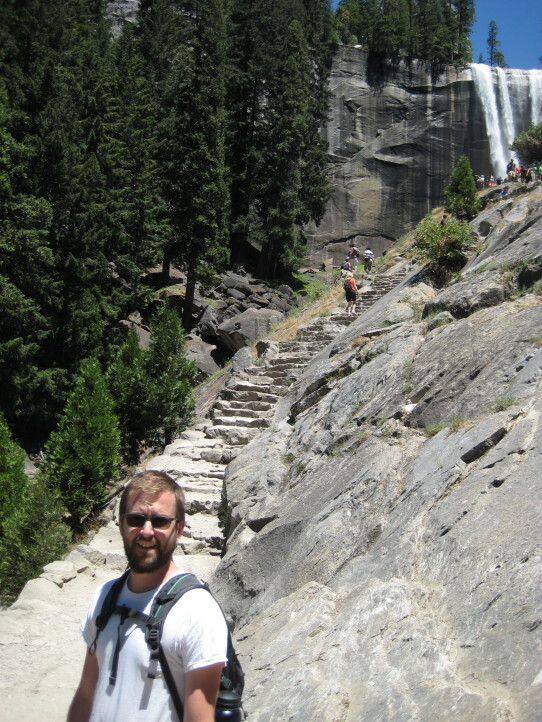 After a couple hours of hiking and climbing more steps we reached the top of Nevada Fall. This portion of the hike had much less traffic than the first leg. We took our obligatory selfie to commemorate the accomplishment. 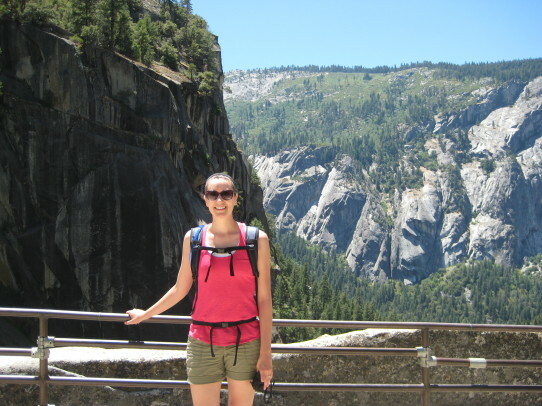 While we were at the top of Nevada Fall we spent time hiking around the area. It’s a large open area with plenty to see. Pools, rock formations, and stunning vistas just to name a few. 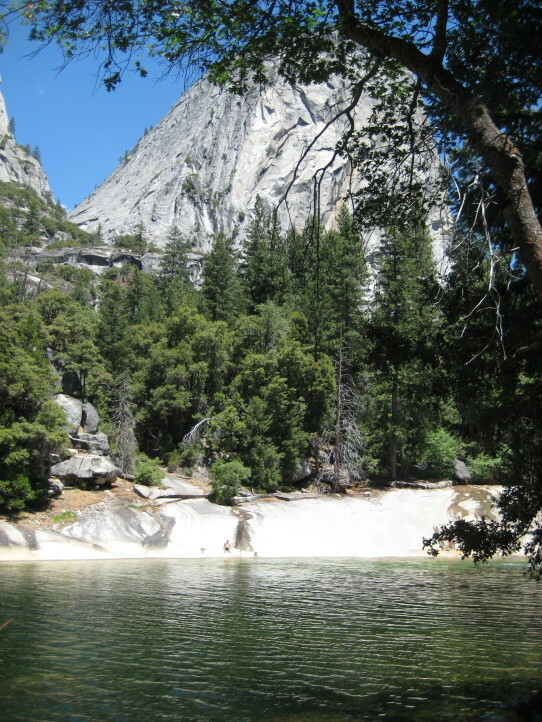 If you visit in the summer when water flow is at a minimum you’ll likely see swimmers in the upper pools. Although it’s well-marked that this is against the rules, it was tempting to give it try! If you are afraid of heights this is a bad spot for you to peek over the edge. After spending a little time at the top it was time to head back down. 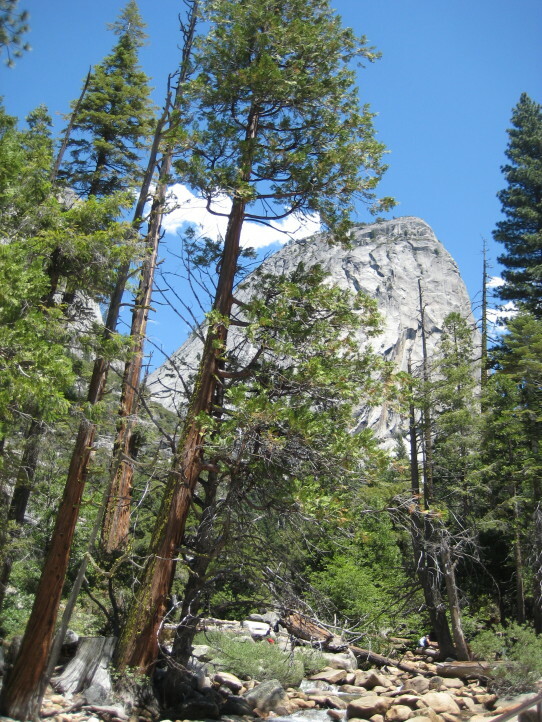 We decided to take the John Muir Trail after talking with a fellow travel blogger on twitter who told us about the impressive views of Half Dome, Liberty Cap, and Nevada Fall. It’s roughly the same distance as the Mist Trail, but it has very few steps. 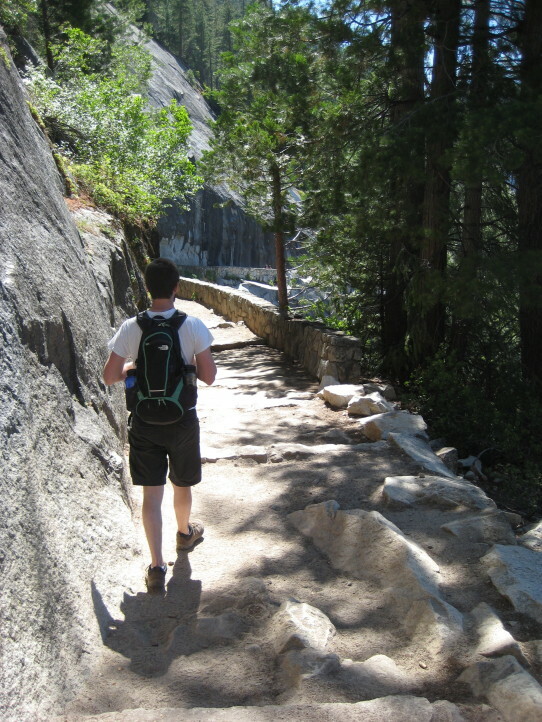 The John Muir Trail is full of switchbacks and takes you down the hillside at a steady decline. It’s much easier on the knees than steps, however, and not nearly as scary if you’re afraid of heights. 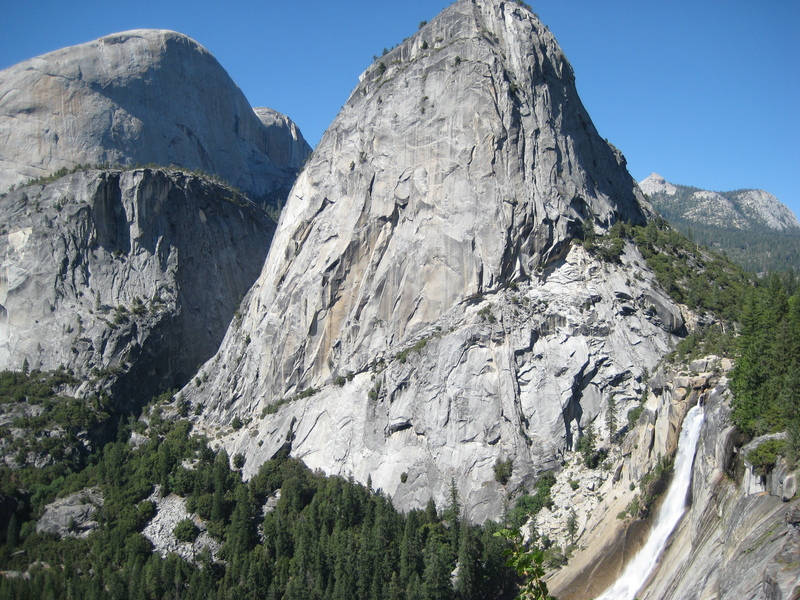 And here’s the impressive view of Nevada Fall, Liberty Cap, and Half Dome that we were talking about! 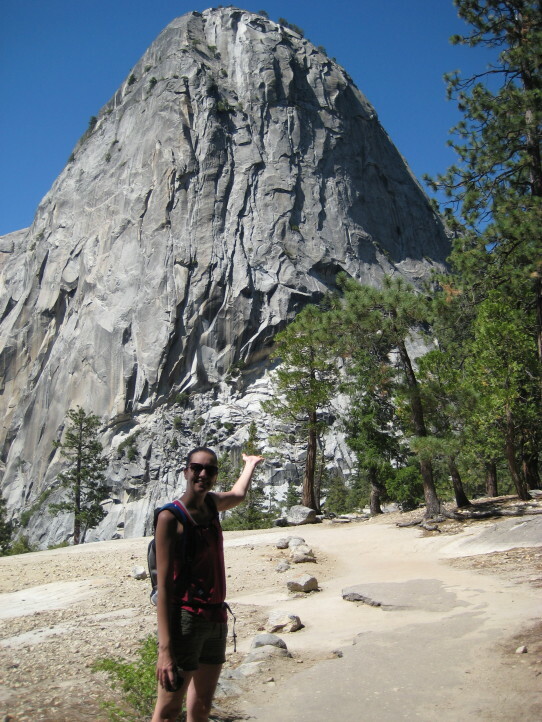 Christy stopped for a second to present Liberty Cap in all its glory. About halfway through our descent we started to feel it in our legs. Each stepped we took proved to us a little more how out of shape we were. This trail was also unrelenting in its reminders that we are from the midwest and not used to hiking in higher elevation. Typically we don’t travel any higher than say 1 or 2 corn stalks. Unrelenting as it was, this trail was certainly worth the effort. And as if sent from the heavens above, this black bear was at the bottom waiting for us to make the hike just a smidge better. Well played Yosemite, well played. 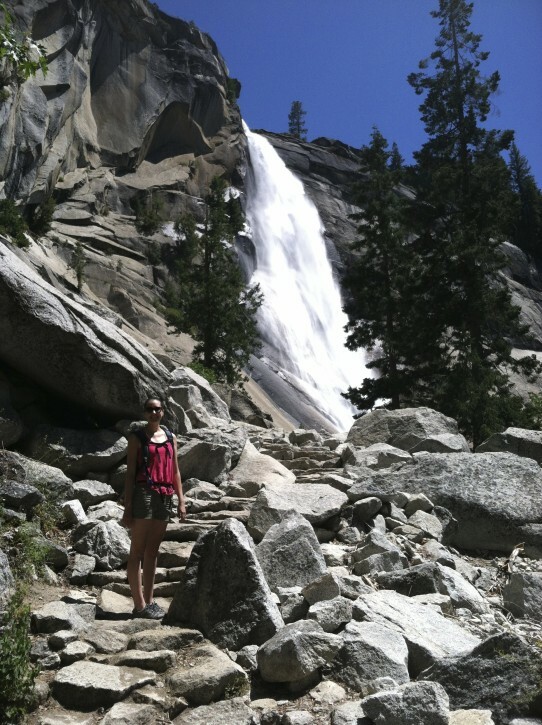 Have you hiked the Mist Trail? Tell us about your experience in the comments below.